KINGSTON, JAMAICA--(Marketwire - January 15, 2008) - Digicel, the fastest-growing telecommunications operator in the Caribbean and new entrant to the Central American market, today announced significant year-end growth achievements in 2007. As the largest GSM operator in the region, Digicel ended the year with more than six million customers, a total investment exceeding US $1.9 billion across the region and new business operations in Suriname, Guyana and El Salvador. "Digicel's progress in 2007 reinforced our position as the Caribbean's leading mobile service provider and demonstrated delivery of sustained growth in our current markets, strategically expanding operations in new markets and providing exciting, first-to-market technology innovations to all of our customers," said Colm Delves, Digicel Group CEO. mobile penetration increased to 35 percent. Significant investment in Honduras is planned to build a world-class network and operation that is set to stimulate growth in the mobile market by increasing mobile penetration within the next five years from approximately 38% to 75%. Honduras has a total population of close to 7.5 million. ZTE, the Coral handsets are among the least expensive on the market. device for fleet management companies. roaming agreements with 245 partners in 130 countries around the world. have committed to license Digicel Pacific Ltd shortly. "2007 was a phenomenal year of growth for Digicel," added Colm Delves. "As we look ahead to 2008, we are very excited about further strengthening our presence in current markets, strategically expanding our business operations in new markets and continuing to bring new technology innovations and products to all of our customers." rate of more than 50%. chargeable event in the last 30 days. 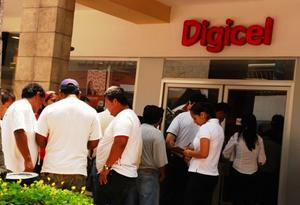 Since its launch in 2001, Digicel has become the fastest-growing wireless telecommunications operator in the Caribbean. After six years, Digicel is renowned for competitive rates, unbeatable coverage, superior customer care, a wide variety of products and services, and state-of-the-art handsets. It is the largest GSM operator in the region with more than 6 million customers. By offering innovative wireless services and community support, Digicel has become a leading brand in the Caribbean and has placed the region at the cutting edge of wireless communications. Digicel is incorporated in Bermuda and has operations in 23 markets including Anguilla, Antigua & Barbuda, Aruba, Barbados, Bermuda, Bonaire, Curaçao, The Cayman Islands, Dominica, El Salvador, French Guiana, Grenada, Guadeloupe, Guyana, Haiti, Jamaica, Martinique, St Kitts & Nevis, St. Lucia, St. Vincent & the Grenadines, Suriname Trinidad & Tobago and Turks & Caicos. Digicel also has coverage in St. Martin and St. Barths. The company is the lead sponsor of Caribbean sports teams including the West Indies Cricket Team, Special Olympics teams across the Caribbean and is title sponsor of the Digicel Caribbean Football Union Cup and the Copa De Naciones, the Caribbean and Central American qualifiers to the CONCACAF Gold Cup. For more information on Digicel, please visit www.digicelgroup.com.